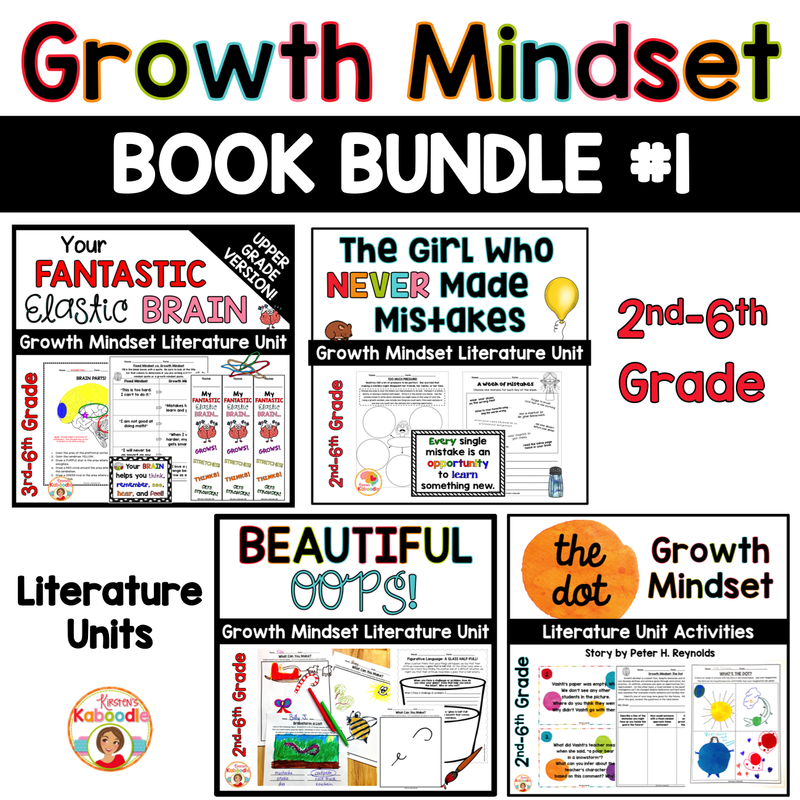 These growth mindset picture books, Your Fantastic Elastic Brain by JoAnn Deak, The Girl Who Never Made Mistakes by Mark Pett and Gary Rubinstein, Beautiful Oops by Barney Saltzberg, and The Dot by Peter Reynolds are perfect for teachers and students who are committed to understanding growth mindset concepts! 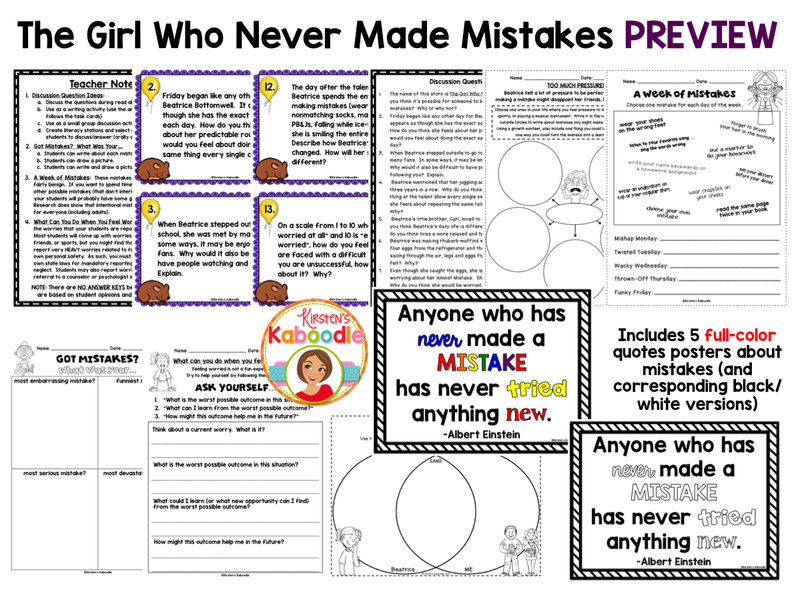 The Girl Who Never Made Mistakes includes activities related to the following topics: discussion questions, compare and contrast, growth mindset vs. fixed mindset (using mistakes as a framework), student reflections, learning from mistakes, famous people in history (perseverance), purposeful mistakes, and feeling worried. Five full-color posters (as well as their black-and-white counterparts are also included. 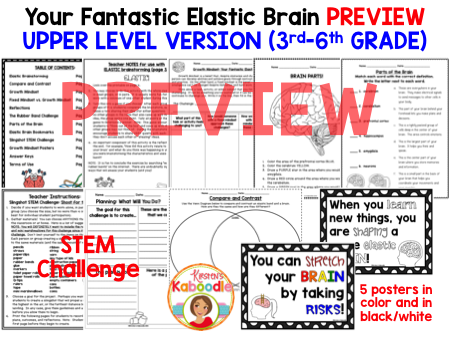 Your Fantastic Elastic Brain includes activities for personal reflection, challenges (including a STEM challenge for creating slingshots using rubber bands), opportunities to identify and clarify growth mindset vs fixed mindset, comparing and contrasting, a rubber band challenge, and various brainstorming and writing activities. Five full-color posters (as well as their black-and-white counterparts are also included. 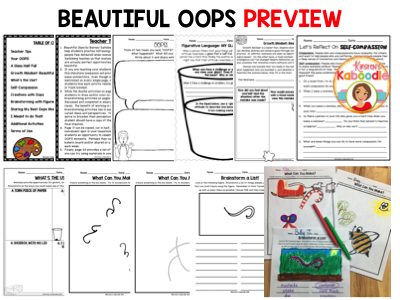 Beautiful Oops by Barney Saltzberg includes teacher tips, your oops activity, a glass half-full activity, growth mindset for Beautiful Oops, what’s the use activity, self-compassion reflections, creations with oops, brainstorming with figures, sharing my best oops moments, I meant to do that activity, and additional suggested acitivies! 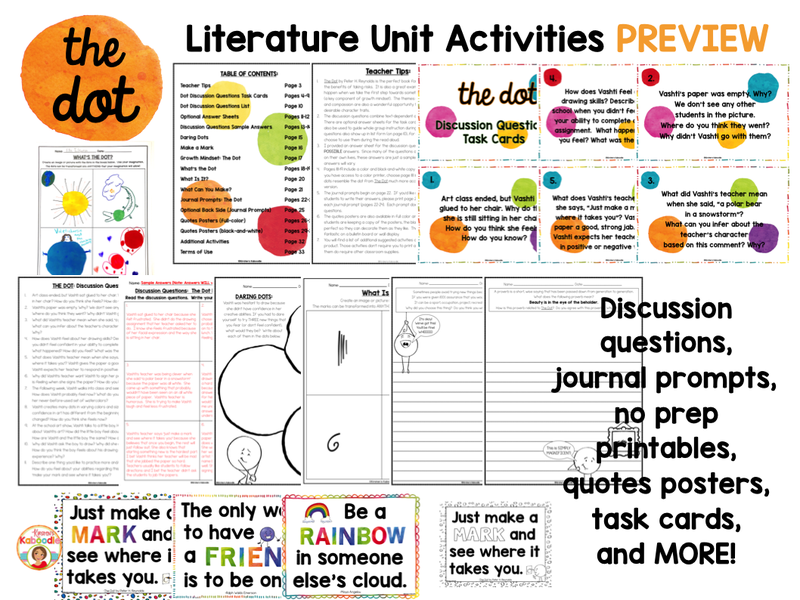 The Dot by Peter Reynolds is a perfect picture book for teachers who want to provide fun instruction on the role of taking risks in growth mindset and fixed mindset perspectives. This file contains 118 pages.